My life journey: Cyprus: Euro is some months away! Finally! Euro's coming to Cyprus as well, then I'll be able to have my Paypal set up to receive donations from readers or for interesting campaigns I've scheduled for next year. The exchange rates from CYP (Cyprus Pounds) to EUR (Euro) are to be announced these days (mid-July). 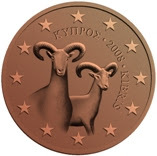 The first coin, holding the mufflon image, is going to on the back of 1, 2 and 5 cent coins. 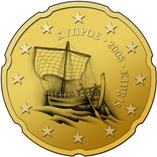 The second one, with the ship of Kyrenia (4th century B.C. 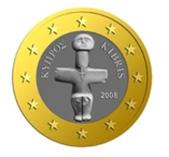 ), will be for 10, 20 and 50 cent coins and last but not least, the cross-shaped idol (dating back to the chalcolithic period) will be used at the back of 1 and 2 euro coins.